Get yourself some ginger ale and soda crackers, because I predict you'll soon be as nauseated as I was when I discovered the truth. The marketing of "murderabilia," as it has been coined, is a business that's not only alive and well on the Internet, but actually thriving. A pubic hair once attached to Arthur Shawcross. A bad painting of Charles Manson by John Wayne Gacy. 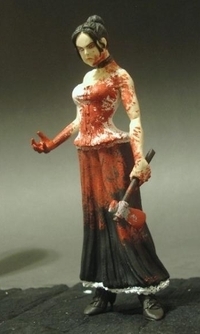 A Lizzie Borden figurine dripping with fake blood. If any of these are on your wish list, we have to talk. About where to shop! "Crime memorabilia" or "murderabilia" refers to collectibles by or about murderers or other infamous criminals. Needless to say it's not everyone's cuppa joe, and there has been backlash not only from the public and media but from legislators disgusted with the idea that anyone would profit from crime so very directly. One fellow recently tried to put up a bit of murderabilia on Ebay with interesting results. Marty Graham came into possession of a ballpoint pen bearing the stamped imprint JOHN WAYNE GACY -- ones that Gacy had made for distribution to promote himself as an honest businessman long before his conviction and eventual execution. Within hours of listing the pen for sale on the auction site, Marty Graham found his offering delisted; Ebay won't sell murderabilia... until a full century, a hundred years, have passed, and presumably there is no one directly touched and left alive to object. Soooo -- no recent murderabilia is allowed on Ebay. So no Yorkshire Ripper letters, either. Sandra Lester -- at one time romantically tied to Peter Sutcliffe -- tried to list her correspondence from him on Ebay with the same result. After deciding to sell her collection, she's parted with a poem/sketch and several letters, but has more besides to offer the murderabilia collector. Many states passed laws years ago, known as the "Son of Sam" laws, to prevent murderers from profiting from their infamy. The laws have been tossed out as unconstitutional and are rarely invoked today. Supernaught.com -- emphasizing serial killers, but including in its Not For Sale Gallery Jesse Pomeroy's signature, Lizzie Borden's signature, the Columbine 1999 high school yearbook, art by killers like William Heirens, Ed Kemper's clothes, and a handwritten letter by the Rev. Jim Jones. 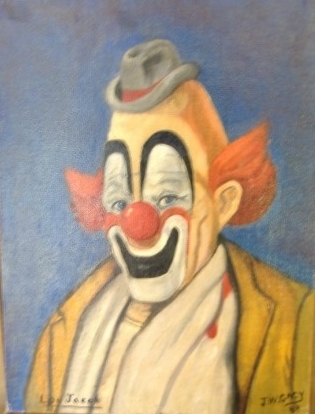 Lowbrow Art World -- art by Gacy, Manson, Ramirez, and their ilk. So... do you collect murderabilia? Have you ever been tempted? Do you vehemently object? Do you understand why anyone would want this stuff? I will confess only to having too much interest in the matter of Miss Borden. If the real Lizzie Borden looked anything like that statuette... I think I'm in love! Gut reaction - runs to the loo!